Ce document au format PDF 1.3 a été généré par Word / Mac OS X 10.2.8 Quartz PDFContext, et a été envoyé sur fichier-pdf.fr le 18/03/2013 à 14:00, depuis l'adresse IP 92.155.x.x. La présente page de téléchargement du fichier a été vue 626 fois. Taille du document: 1.9 Mo (16 pages). 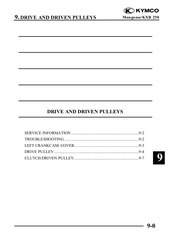 • The drive pulley, clutch and driven pulley can be serviced with the engine installed in the frame. 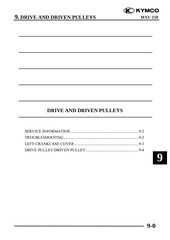 them to minimize the slipping of drive belt and drive pulley. Movable drive face bushing I.D. Remove the gasket and dowel pins. cover, then remove kick starter spindle cover. spring from the left crankcase cover. Remove the kick starter spindle bushings. driven gear forcing parts for wear or damage. return spring onto the left crankcase cover. Install the kick starter spindle. ＊ Apply grease on to the driven gear shaft. First install the dowel pins. eight left crankcase cover bolts diagonally. Remove the six weight rollers. Check each weight roller for wear or damage. Measure each weight roller O.D. 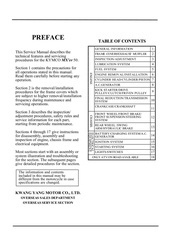 Service Limit: 15.4mm replace if below. Measure the movable drive face bushing I.D. the drive pulley can be tightened. Measure the drive belt width. Inspect the clutch outer for wear or damage. Measure the clutch outer I.D. compressor to avoid spring damage. remove the clutch drive plate nut. disassemble the clutch/driven pulley assembly. Measure the clutch lining thickness. Measure the driven face spring free length. Check the driven face for wear or damage. Measure the driven face O.D. Measure the movable driven face I.D. bearing out of the driven face. Apply grease to the outer bearing. with the sealed end facing up. Seat the snap ring in its groove. Apply grease to the driven face bore areas. Remove the circlips to disassemble the clutch. °ØKeep grease off the clutch linings. Set the circlips in the groove. them onto the moveable driven face. assembly onto the clutch spring compressor. with the flat on the clutch drive plate. install the drive plate nut. °ØKeep grease off the drive shaft. Install and tighten the clutch outer nut. Ce fichier a été mis en ligne par un utilisateur du site. Identifiant unique du document: 00162408.